» Will dockless bikes and scooters take over city sidewalks? Will dockless bikes and scooters take over city sidewalks? As dockless bikeshare and now electric scooter systems continue to expand in cities across the United States, many riders and local officials wonder whether our sidewalks can handle the influx of new vehicles. Dallas, which now has the nation’s largest dockless bikeshare fleet with more than 18,000 vehicles, has residents and city council members pushing back against the flood of bikes. In Seattle, the city government is testing designated dockless parking spots to try and avoid sidewalks cluttered with bikes. Bird, the Santa Monica, California-based electric scooter company rapidly expanding in west LA, believes the transit companies should take the lead in solving the problem. 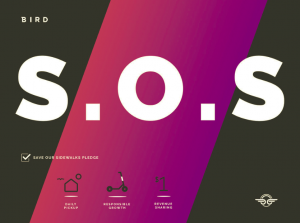 This morning, the company’s CEO, Travis VanderZanden, introduced the Save Our Sidewalks (S.O.S.) Pledge, a plan he hopes other scooter- and bike-sharing companies adopt to avoid overcrowding and abandoned vehicles. His letter to competitors, such as LimeBike, Ofo, Mobike, and Jump, raised the specter of Chinese cities, where the explosion in dockless bikeshare led to “bike graveyards” of abandoned vehicles.